The fresh-made tofu at SBCD Korean Tofu House is the star of the menu, but there is plenty more to love about this restaurant. The City News team is being given a rare tour of the open kitchen at SBCD Korean Tofu House’s new branch at Millennia Walk. Perfect stone rice bowls line a long row of stovetops, all timed for 15 minutes and 20 seconds, the precise amount of time it takes to cook a perfect bowl of Korean rice. But what we really are here for is a tofu-making demo by Chef Kim Woo Jip, who comes from Korea. Special Korean soy beans are soaked overnight in preparation for tofu-making. These beans are procured from farmers in Paju, a rustic area near the DMZ between North and South Korea, untouched by chemicals and other human evils. Doesn’t seem like much till you actually taste the tofu, but I’m leaping ahead of myself. The soaked beans are placed into an industrial grinder and mill, and what looks like 15 liters of water are then introduced after the soy beans. What comes out of the grinder spout is thick, frothy soy milk whiter than Snow White’s skin. This liquid is then boiled in large vats for 30 minutes, and then cooled in cuboid containers along with Glucono Delta Lactone,a kind of salt that helps solidify the soy milk creating a firm curd. These containers are then fully cooled, then chilled for use. Chef Kim makes two vats of these daily. This creates just enough tofu for one day’s orders. SBCD’s tofu is made fresh every morning, and it is the main reason why, if you’re a tofu lover, or even if you’re not a huge fan, you should dine at SBCD. Korean food has gained great popularity in the last few years, thanks to Singapore’s grand love affair with oppa-filled Korean dramas. Korean eateries sprouting up everywhere and Korean groceries becoming a mainstay in many households. Hence, it’s not all that easy for an eatery to stand out from the crowd, but SBCD really does. Started by Korean Chef Nam Kyoung Soo, SBCD’s philosophy is to bring to Singapore an “uplifting and complete meal”. 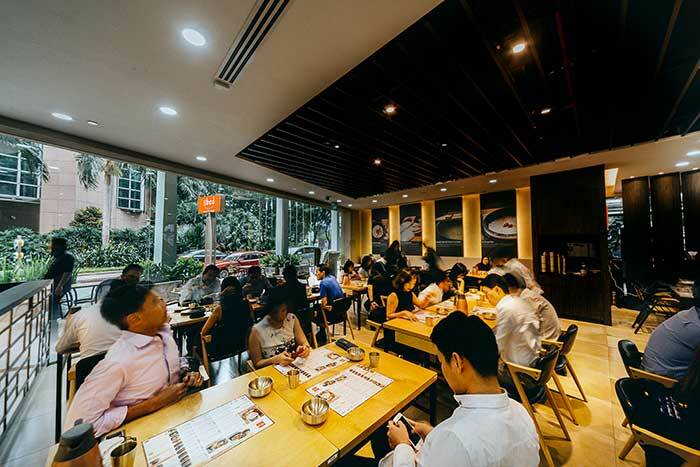 Indeed, in this 154-seater Millennia Walk outlet, there is no shortage of authenticity when it comes to taste. The restaurant’s menu is fairly wide, spanning its signature Soontofu bowls, spicy BBQ items and rice bentos. Even its stone bowl rice is a minor “event”. There definitely are enough choices to please just about any palate. The must-have is the Soontofu, a bowl of hot delicious broth which comes with meat, seafood or combined versions. Hot favorites are the Spicy Seafood and the Assorted (seafood with beef). I say hot, because you can choose your level of spiciness, which goes from Mild to Crazy Spicy. Of course, I recommend Crazy Spicy. Yes, there are non-spicy versions too. The base broth is a work of art: made with 10 secret ingredients and left to steep for 24 hours. Special mention must be made of the Seafood Soontofu because the broth is extraordinarily flavorful, filled with prawns, squid, crab and mussels. The quivering scoop of tofu right in the center of your bowl is the real star: softly sweet and pure when eaten by itself, it transforms into a silky mouthful literally bursting with flavor when eaten with seafood (or your choice of) broth. This bowl is really good to the last drop, and is a must-try. Your bowl comes with condiments: a yellow Croaker fish (deep-fried and yummy), spicy seafood, kimchi and Korean seaweed. I recommend a side order of stone bowl rice. The SBCD custom is this: scoop three-quarters of your rice bowl out to eat, then fill the rice bowl with hot corn tea (available in flasks at your table) and cover it. The soft “porridge” that forms is a traditional close to your meal—it is said to aid digestion. It’s a good idea to dine at SBCD with friends, because the main dishes are also too good to miss. 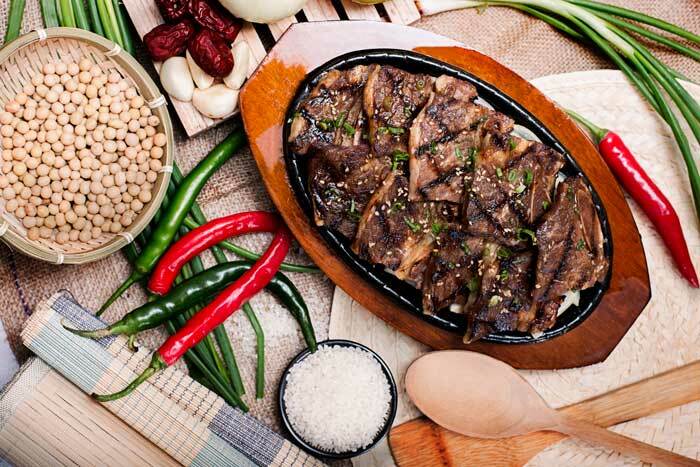 The team’s favorite is the LA Galbi BBQ short ribs: tender, smoky and grilled to perfection. The spicy Galbi chicken is also a good order—or choose the teriyaki grilled chicken for more sensitive palates. And if there is still space, or if you are dining with some very hungry people, do try the Korean pancakes. Fluffy and perfectly balanced with spice and vegetables, they’re delightful when eaten with the light soy sauce they’re served with. SBCD Korean Tofu House has two locations: 9 Raffles Blvd, #01-114, Singapore 039596 Millennia Walk and 7 Wallich Street, #B1-01/02, Singapore 078884, Tanjong Pagar Centre. 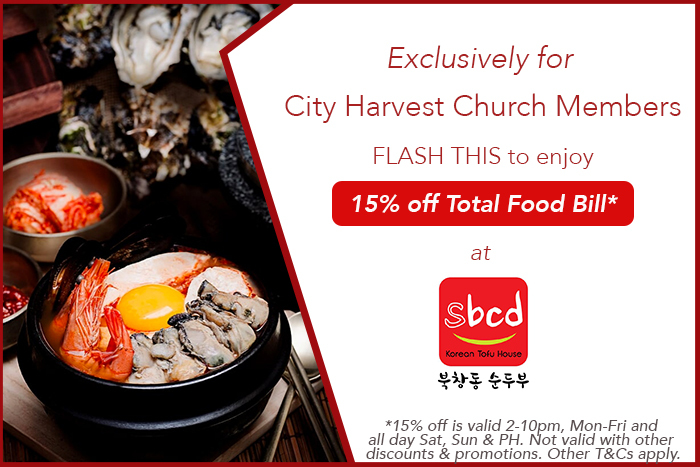 City Harvest Church members who dine at SBCD after 2pm from Monday to Friday and all day on the weekends, enjoy an exclusive 15% off their total food bill when they show this coupon before ordering. Also, as part of their December promotion, kids dine free on Saturdays and Sundays.